For the B prompt for February Christmas cards, I used the Bokeh technique. I made the polished stone look on glossy card stock using alcohol ink and then used a stencil with circles to lift off the ink in the circles using 98% alcohol. The stamps are from Sparkle N Sprinkle. 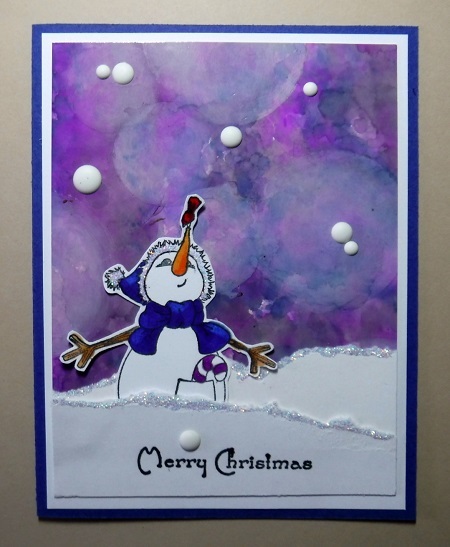 I added Stickles glitter glue to the hat and snowbanks. I love your background, this is a great winter scene! Love your Bokeh background and the white enamel dots. Such a cute card!